A Belgian military veteran and former United Nations peacekeeper tells how he rescued his son from the infamous terrorist group. Failing to find help from Belgian authorities when his son, Jay, disappeared, Bontinck had no alternative but to fall back on his own resources. Fortunately, he was armed with both love for his son and the personal courage sufficient to succeed against the deadly dangers he encountered during his mission. His personal, in-depth account is a powerful dissection of the step-by-step recruitment of his son into the web of Islamic terrorist networks. This process began when Jay’s new girlfriend, a Muslim from Morocco, asked, “why don’t you convert to Islam?” After attending a few services at a local mosque, he changed his name and clothing, grew a beard, and became a participant in a radical group called Sharia4Belgium. When Jay was 18, Bontinck learned that a friend had called to tell Jay that he was in Syria along with all of Jay’s friends. Jay deceived his father with a duplicitous cover story and left to join them. Discovering a clue to his son’s whereabouts from a video on YouTube, he began his quest to find him. Jay, meanwhile, had aroused the suspicions of the terrorists and been thrown into an underground dungeon as a suspected enemy agent. 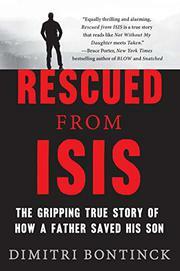 Frequently one step behind Jay’s captors, the author was captured but was able to escape, and he developed a network that helped him track down his son, who had been sent to die working in Aleppo. Arrested as a terrorist on his return, Jay provided information to law enforcement and helped convict the recruitment network in court. Bontinck had done what no one had before, and he became the person other families could turn to for help. A moving personal account that offers profound insights into Islamic terrorism and the struggle against it.